A Fort Collins apartment portfolio that caters to Colorado State University students sold in a $58 million transaction. Ohio developers Edward and Herbert Newman of Summit Management Services Inc. bought the Ram’s Crossing portfolio, which consists of 459 units. The buyers plan to spend $1.5 million over the next two years renovating 330 of the units with new kitchens, baths, flooring and appliance upgrades. “Since our first venture into the Rocky Mountain markets in 2008, we have had considerable success in increasing multifamily asset values in secondary and tertiary markets,” Amit Pollachek, Summit Management Services executive vice president, said in a statement. • The Townhomes at Ram’s Crossing, 22 units, completed in 1997. The communities are located at 1117 City Park Ave., 908 and 914 W. Lake St., and 2155 Orchard Place. They offer a wide variety of product and unit mix, including studios; one-, two- and threebedroom apartments; and loft- and townhome-style units. The properties sold for an average of $126,361 per unit. Most of the units are located in close proximity to the campus. “They are all pretty well occupied,” said Potarf. Northern Colorado’s apartment vacancy rate is 3.59 percent, but it would be even lower were it not for units being vacated because of renovation at a Fort Collins property, according to Apartment Insights. Affiliates of Boulder-based Walnut & Main Real Estate Co. sold the Ram’s Crossing portfolio in an off-market transaction. The portfolio was assembled over several years. After learning the seller was interested in disposing of the assets, Potarf approached Akron, Ohio-based Summit Management because of its desire to acquire additional properties in Fort Collins. 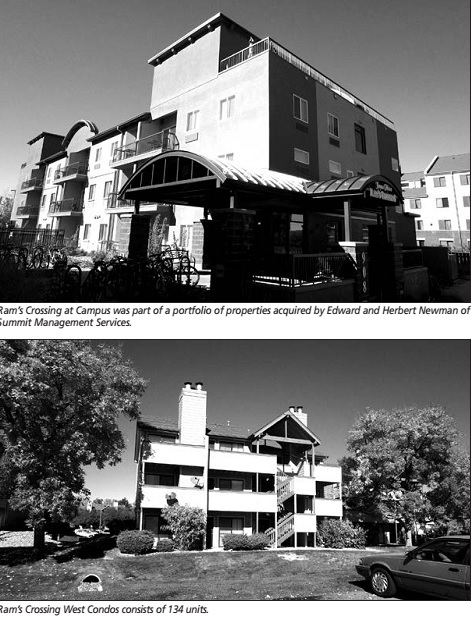 Summit Management Services’ other Fort Collins properties include the Arbors at Sweetgrass, Stone Creek Apartment Homes and the Landmark Apartments. The acquisition brings the company’s portfolio to 4,500 units nationwide and 1,006 units in Fort Collins. “We have owned in Fort Collins since 2007 and love the growth of the market and the growth of Colorado State University,” said Summit Management President Doran D’Avello. The portfolio was purchased for SMSI by Summit MultiCapital LLC, Summit Management Services’ acquisition and financing arm. It was financed through U.S. Bank, Cleveland, in conjunction with JS MultiCapital Corp.